The history of recorded music dates back only to the late 19th century. In that brief time, music has transitioned from something people made and enjoyed together, to something most often purchased for solitary consumption. In itself, that’s not necessarily a bad thing – thanks to recording technology (and now, the Internet) I enjoy access to a wonderfully diverse selection of music. I do sometimes wonder, though: how might things be different if we could return to being producers of music, rather than solitary consumers? This idea, to some degree, explains the interest I’ve developed in the past few years with various forms of “roots music.” From commercial releases to ethnographic field recordings, these documents of folk, country, and blues performers represent music at its most direct and elemental. There’s an immediacy and energy in these recordings that moves me deeply. I think that’s why I’ve also become fascinated with the “do-it-yourself” approach to making music. I’ve been an amateur guitar player for a long time – but about four years ago, I decided to attempt building my own instrument. Since then I’ve completed four such projects, each based on a hybrid of the guitar and the Appalachian dulcimer – a dulcitar, if you will. My latest dulcitar – front (left) and back (right) views. My latest creation uses a cigar box my wife collected before we started dating – probably cedar – as a resonator. I cut f-holes into the top to let sound flow out of the box. The neck is poplar, and the fretboard is a wood called black palm. I think the fretboard is beautiful, but the black palm proved to be very splintery – I don’t know if I’d use it again. I like to add new challenges with each successive project; this was the first time I attempted traditional fretting (easier than I expected, once I had the proper tools) and tried making a nut from synthetic bone (a complete failure – I had to call in a professional on this one). Overall I’m fairly pleased with the results. 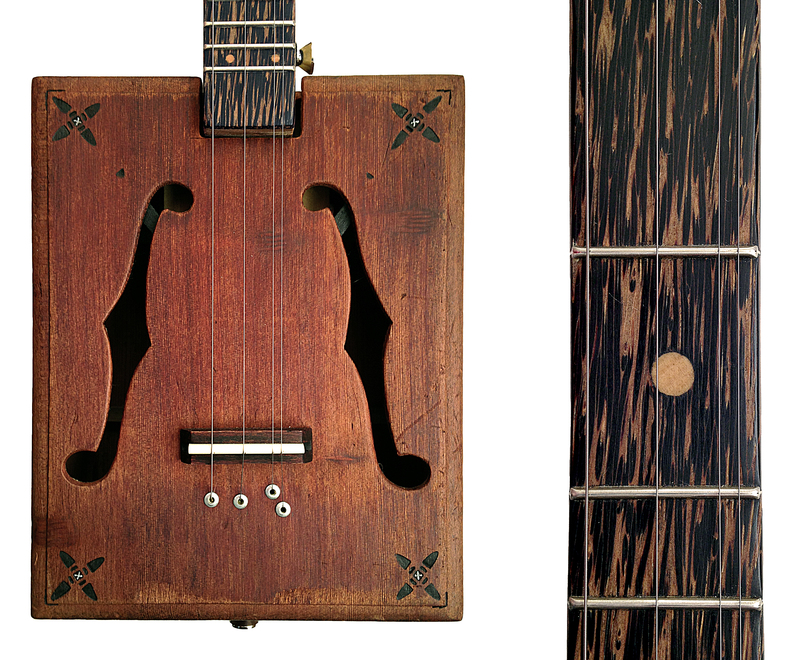 Detail of the cigar box body (left) and fretboard (right). Probably my favorite aspect of this cigar box dulcitar is the surface decoration – my sweet and talented spouse used her new woodburning kit to add some folksy flair. 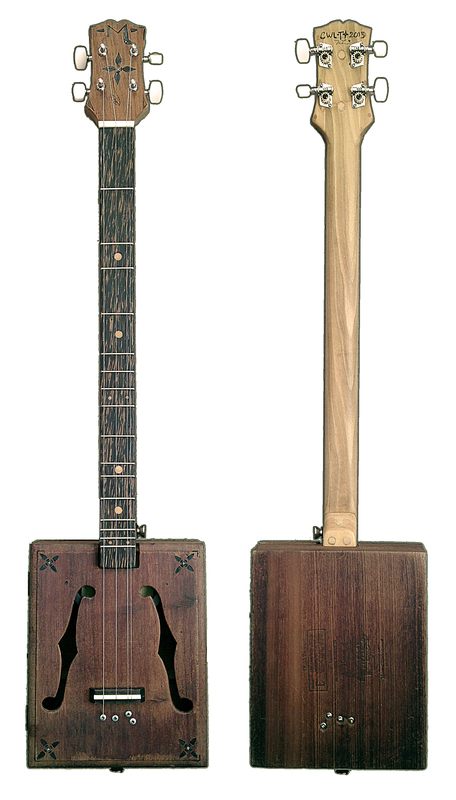 The “M” is for Maybelle Carter – I chose her (and her iconic Gibson L-5) as my inspiration for this project. 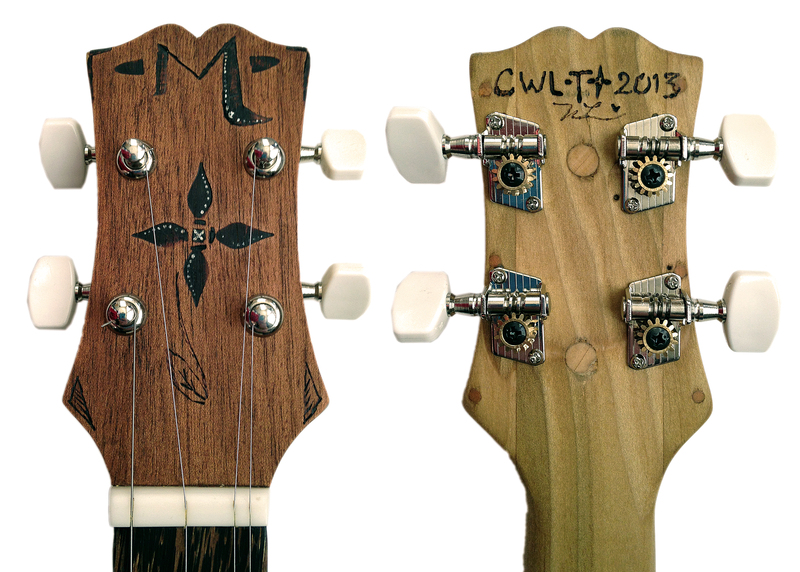 The headstock – front (left) and rear (right) views. How does it sound? Click here for a brief sample!